Chimney flashing is used to seal the joints between the roof and the chimney so that water cannot penetrate through it. With the change in temperature these joints expand and contract so flashing is necessary. Having the flashing in its best shape is advised for preventing the rainwater from leaking into the building. 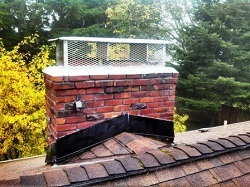 For services related to chimney flashing repair and chimney counter flashing, Seattle & Tacoma area residents can contact Professional Chimney Solutions Inc.
By hiring us for the chimney flashing repair and chimney counter flashing, Seattle & Tacoma area residents can save a lot of their money on costly future repairs. The best way to repair chimney flashing is to get it replaced. We provide our clients with expert masons who are well versed with the latest technology for chimney flashing repair. Seattle & Tacoma area homeowners need to just give us a call and our mason will be there to help them. By keeping up with regular inspections, problems in the chimney flashing can be rectified in time. A leaking chimney can cause a lot of inconvenience to you and your family. Chimney leaks, if not checked in time, can cause damage to the chimney which will be irreparable and the replacement of the chimney will be required. Therefore, proper installation is the necessary step in chimney flashing repair and residents in the Seattle and Tacoma region should not ignore its importance. By installing chimney flashing, Seattle & Tacoma homeowners can be sure that their chimney is leak proof. As the flashing prevents the entry of rain water or melted snow into the living space therefore it is regarded as an important part of chimney. Waterproofing the chimney is a preventive measure that can be taken to increase its life. Therefore, the chimney counter flashing can wear out or fall off with the passage of time. The chimney counter flashing should always be in a good condition to avoid the seeping in of rain water and for keeping the chimney in good condition. We at Professional Chimney Solutions Inc. bring in cost-effective measures for the homeowners of the entire Seattle and Tacoma region with chimney counter flashing repair solutions and installation services to leak-proof your chimney. Call us today at (253) 448-3987.